SPECIALE 4 / 23-26 Sconto del 20% = Solo $ 134 / Nt!Lusso 2BR!Servizio spiaggia GRATUITO!2 piscine!Hot Tub! 2 camere 2 bagni 7 posti letto! Spiaggia privata! Vi invitiamo a Scenic Gulf Drive per godere della nostra casa di vacanza sulla parte superiore (4 ° piano) di Bldg 1 (lato destro) a Maravilla Resort. C'è una ragione che essi chiamano 'Scenic Gulf Drive' Si può godere di miglia di mountain bike, jogging, a piedi e dal nuovo percorso proprio di fronte a Maravilla lungo questa bella strada panoramica. acque di sabbia bianca di zucchero e smeraldo abbagliante sono in attesa per il tuo divertimento! Maravilla è una delle località più ambite della famiglia della Costa Smeralda! Per meno rispetto al prezzo di una notte normale stanza d'albergo, voi e la vostra intera famiglia può godere di tutti i comfort di un condominio di lusso e le spiagge incontaminate di Destin. Maravilla è una delle poche località che possiede una propria spiaggia. Sì, una spiaggia privata solo per gli ospiti del Maravilla. Un sacco di aree erbose verdi e un enorme parcheggio a guidare scooter, rollerblade, lanciare frisbee e giocare. Maravilla si trova lontano dalla folla e la congestione di grattacieli. Questa posizione è la migliore! shopping di lusso a "Silver Sands Premium Outlet Mall" si trova a 2 miglia a est e più recenti "Destin Commons" di Destin si trova a 4 miglia a ovest-75 negozi, 14 teatri, e 9 ristoranti, tra cui il nuovo Hard Rock Café! Questa è veramente la nostra "casa lontano da casa 'e siamo sicuri che potrete godere di tutti gli extra. • ripiani in granito in cucina! • L'accesso al nostro balcone privato coperto da 30 piedi è o dalla zona giorno o dalla suite principale. SERVIZIO SPIAGGIA GRATUITO: Ombrello / 2 sedie da spiaggia allestite (dal 10 marzo al 31 ottobre Meteo permettendo) ASCIUGAMANI SPIAGGIA, ROLLING COOLER, BOX DI COPERTA PIENO DI GIOCATTOLI SABBIA! SEDIE EXTRA SPIAGGIA! Raccolta video, giochi, giocattoli, 2. Spiaggia privata recintata di 5 acri, 2 piscine (1 fronte spiaggia, 1 riscaldata), vasca idromassaggio, centro fitness, club house, tennis, basket, shuffleboard. The condo was beautiful. We felt right at home immediately. Everything was so nice and clean. The condo had everything that you could need or want to help you feel right at home. We hope Dianne's condo is available the next time that we are able to visit Destin. We had a wonderful visit. Host was quick to respond to all questions and very accommodating. Very clean and relaxing! There was nothing negative I could say about our stay. Everything was very kid friendly and we had a great time. We had a wonderful stay. The owner was amazing and answered all of our questions promptly! It was extremely clean and had a well-appointed beach décor. Also, we were so glad that you were on the top floor because in other stays at Maravilla, we had too much noise from people stomping above us. It was really nice and quiet but close to everything! The location can’t be beat. We like that Miramar Beach seems to be less congested than other areas of Destin. We could walk to Pompano Joe's and an Alvin’s Island. The pools and hot tub were very nice! The kitchen was well stocked with everything needed to cook, including spices. And there were many extras that we all enjoyed such as a cooler, beach towels, games, extra beach chairs, sand toys, plus a good supply of paper products, soaps and such. The proximity to the beach was perfect, a quick walk and we were there. It was actually closer than anticipated. The guys on the beach had our chairs and umbrella ready for us each morning! The beach was beautiful, the people were great, our stay was relaxing and enjoyable and we can’t wait to return to this condo. Diane was always very prompt in getting back with us and made booking very easy. The unit is pretty much as described. Kitchen is well supplied with pretty much everything you need if you choose to stay in and cook. Although, we prefer to go and enjoy the many restaurants that the area offers. One of our favorite places is Dewey Destin ( the first resturant) since we traveled this trip with two small children, it makes it easier to set out on the dock. 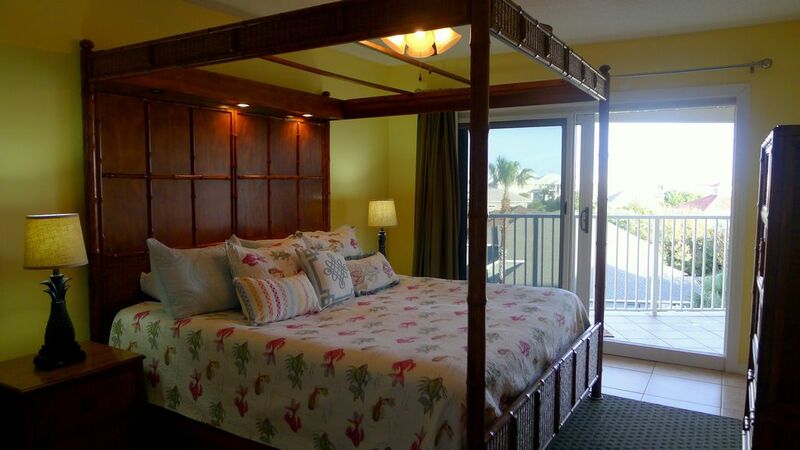 Would recommend this unit to someone that does not mind a short walk to the pools or beach. We went to Maravilla for our family vacation this year and it was awesome! The condo was very clean and comfortable. The location was perfect. Dianne was very helpful with reservations and any questions. I would recommend this condo.